Is this the future of wireless charging? 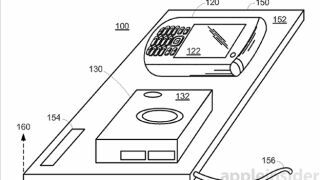 Apple's entry into the wireless charging arena may see the company introduce a far more advanced solution than current generation charging mats, according to a patent recently granted to the company. The patent, filed with the US Patents and Trademarks Office, explains how different functions could be performed depending on how a phone, media player or camera is placed on the inductive charging pad. For example, if an iPhone were to be placed face-down, the mat it would charge the device, while positioning it face-up would also see data synced with a nearby laptop or desktop computer. Beyond that, the smart dock would also be able to recognise the precise positioning of the device to automatically commence the data transfer, according to the filing. According to the patent, the dock would also feature a dedicated processor, integrated power supply, other I/O ports and other hardware features. Within the literature for "Device orientation based docking functions," Apple explained: "A user device such as a smart phone, digital camera, or personal media player may be docked to a docking device, which may allow for charging and data transmittal. Some docking devices may provide induction charging to charge a user device, when the user device is placed on a charging surface. "The user device may include circuitry which may respond to a magnetic field provided by the charging surface. Data may be transmitted between a user device and a docking device, or a host device, when the user device is docked." Of course, it goes without saying that just because Apple has filed this patent, doesn't mean the tech is definitely on the way. However, it does tie in with recent reports claiming the company is working on building inductive, solar and motion-powered batteries for the next generation of iOS devices and wearables.